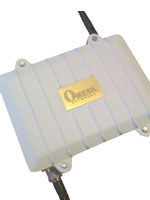 The product can provide standard WiFi broadband access beyond the wireless mesh station. The radio is based on IEEE 802.11 standard to realize OPM (Opportunistic Mesh) dynamic networking with multi-frequency (or large-scale cognitive networking). OPM dynamically establishes wireless networks without the need for predetermined topology or spectrum allocation, greatly simplifying deployment. Reliable and real-time (multi-hop) wireless communications can be achieved in large-scale wireless networks, regardless of dynamic networking environment. Network performance also increases with the network scale (density and the number of stations). It has been proven to achieve 5-10 times higher bandwidth than state-of-the-art technologies in multi-hop and/or interference intensive environments. 5) compatible with current wireless networking standards.